On Tuesday, August 11th (2009) the “Authorized news web site of The Church of Jesus Christ of Latter-day Saints” (Church News) showcased a lecture given by John Gee, “an associate research professor of Egyptology at the Neal A. Maxwell Institute for Religious Scholarship at BYU” (the organization formerly known as FARMS). “‘…if what is most important needs to be defended, what are some of the things that need to be defended?’ he asked. Joseph Smith began the “translation” of the text of the Book of Abraham in 1835. The translation was printed in LDS publications in 1842, 1851 and 1878. It was officially canonized as LDS scripture in 1880. While giving lip-service to the claim that the Book of Abraham is true, Dr. Gee’s comments actually serve to place something Mormons recognize as sacred scripture on the ‘irrelevant shelf’ to gather the dust of neglect. If Mormons believe the Book of Abraham is true, if they believe it is “the word of God as revealed to His inspired prophets,” and if continuing revelation is central to the restored gospel, how does Dr. Gee, and by extension the LDS Church, come to say it’s not all that important? The implication here is that LDS leaders recognize that if the Book of Abraham really isn’t true—if Joseph Smith’s prophetic work known as the Book of Abraham is fraudulent—they will still encourage Mormons to sustain Joseph Smith as a true prophet. Nevermind that Joseph Smith was acting as a charlatan, claiming to translate by the gift and power of God. Nevermind that church membership, by “common consent,” was in error when it sustained the canonization of the Book of Abraham in 1880. Nevermind that the LDS Church has been wrong to include it in the LDS canon of scripture for the last 129 years (What other things might be erroneously included in the LDS canon?). Nevermind that doctrines that have arisen historically or have been solidified by the Book of Abraham are called into question, such as pre-mortal existence, the multiplicity of gods, and the co-participation in the work of “creation” between God the Father and “the gods” (including Adam). Nevermind that Joseph Smith unnecessarily required great sacrifice on the part of the Latter-day Saints in 1835 when he solicited $2400 to purchase the Egyptian papyri. Nevermind that prophets are supposed to represent God Almighty and that they should be held to higher standards than mere teachers or politicians or world leaders, particularly when doing something in the name of God. Nevermind that people have left the “one true Church” over their loss of faith in the Book of Abraham. Nevermind that no one told them this LDS scripture was unimportant. The Church bid them fond farewell and as a result families have been split. Lives have been rocked. Tears shed. Hard words exchanged. Marriages broken. For what? For something that now, in 2009, doesn’t really matter anymore. No apologies, no repentance, no major doctrinal reversals. This entry was posted in D&C and Pearl of Great Price and tagged Book of Abraham. Bookmark the permalink. Rich, 1) its not hard to be dated after the time of Abraham. It would actually be better if they are from the time of Abraham. 2) No issues with them not being an autograph, but that is really what we’re discussing about the meaning of Smith’s words. 3) Is that the title, or is that what Smith wrote about them? In the grammar of the quote, commas separate the title of Book of Abraham and the words written by his own hand. Commas are usually to separate the words, right? Notice also gramatically, that the words written by his own hand are lower case. Again, something that usually indicates something not a title. Now, of course, we can be talking about past customs and those custom’s don’t have to represent what we know and do now. But it leaves a big huge red flag there because based on that alone, we don’t know. But, given several tendancies of Smith, I think I am more than confident of the conclusion reached by those not in Mormonism make. We know enough of them to make a pretty solid judgment call that they cannot be true. But, alas, you can ignore the logic and rely on your testimony all you want. But God is calling you to something different, if you’d only check the scriptures to see what they really mean and stop putting your own meaning on them. This is what the Bereans did, is it not? What adjective did they earn? That’s right, noble. What else are we warned about? Following spirits blindly? Yes, that IS right. Interesting as to date, not one of you posters has laid a finger on the BOA. Common debating techniques are to discredit it by indirection, that is going after the method and person by which you ASSUME it was produced. I would invite the best of the best you have on board here at “Coffee”, and using their superior education, talents, gift and vast resource materials to author anything like it. “written by his own hand, upon papyrus” is really and actually part of the original Egyptian Title, and was Abraham’s own title. Are you starting to get it. Not at all related to Joseph Smith as the originator of this Title. “Two important and peculiar aspects of ancient authorship must be considered when we are told that a writing is by the hand of Abraham or anybody else. One is that according to Egyptian and Hebrew thinking any copy of a book originally written by Abraham would be regarded and designated as the very work of his hand forever after, no matter how many reproductions had been made and handed down through the years. The other is that no matter who did the writing originally, if it was Abraham who commissioned or directed the work, he would take the credit for the actual writing of the document, whether he penned it or not.” Nibley. Wow Hank, that’s quite an assertion. So you have the original papyrus that everyone has been searching for? I suggest you let everyone see it so it can be translated and we can settle this issue right here and now. Well I would rather worry about that then trying to figure how you can believe that the BOA came from the 11 fragments, and disclaim what many of the historical witnesses described them to be. I would call that a mental disorder similar to not understanding why you can not put a round block into a square hole, even though all the evidence prove it is impossible, your persistence only give more ammunition of a flawed thinking process. ALL OF THE PAPYRUS came out of mummy coffins. 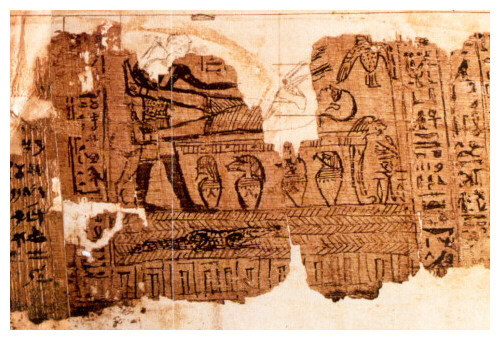 ALL OF THE FRAGMENTS that are left show us what should seem very rational… that the papyrus were Egyptian “burial papers”. You, I’m sorry to say, are the one with the round block and a square hole. There is no reason why some terrific (contradictory to the Bible and the other book in the PoGP) Abraham and Joseph of Egypt literature should be in with the Egyptian mummy burial literature. That it now cannot be found, even hinted at among the fragments that remain, is yet another reason to suspect that it was never there in the first place. If I could take back, for you, every time you chanted the mantra “I know the church is true”, and every time you sealed curses to yourself by going through the temple, I would. Because you are absolutely blind to basic logic on this matter. Yep, finally a true statement, the Facsimiles were nothing more then a attachment to the BOA Scrolls. Funeral text as we have always claimed them to be. They don’t even date back to Abraham. Real witnesses testified what they saw, and described the three scrolls that were bought for Joseph. Old Documents of Abraham, have come to us, and some are similar to Abraham’s story. Dead Sea Scrolls, check them out, similar accounts that seem to hint that Joseph had it right. The Dead Sea Scrolls hint Joseph was right? Please, what are you talking about? Give a reference, a link? If your interested, you know how to Google. If your not, then I would be wasting my time. Mmmhmm, I sure do know how to google. But that’s not what I’m asking. In summary, the Qumran sectarian scrolls indicate that God created all things, including good and evil spirits, as well as the spirits or souls of people before they existed in the flesh, and that God determined which people would be saved and which people would be destroyed. These passages are echoes of the war in heaven and of God’s foreordination of his spirit children, concepts that Latter-day Saints believe were known and understood in previous gospel dispensations. There came a time [in our premortal existence] when . . . we were taught that we would come down here for two purposes: first, to gain bodies, mortal bodies, which would be given us again in immortality, in a resurrected state, as a consequence of an infinite and eternal atoning sacrifice which would be made; and secondly, that we would come here to be examined and tried and tested, to see if we would believe the truth, accept the truth, live the truth, walk in conformity to the mind and will of the Lord, as that was revealed to us by his prophets. Pingback: If Mormonism were true. | Defending. Contending.